Advanced MBSE practices can have a significant impact on Defense & Intelligence systems, especially in the conceptual design and early procurement processes, but even extending through deployment, operation, and disposal. In particular, Model-Based Acquisition offers the possibility of an accurate specification and rapid evaluation of vendor-proposed solutions, enabling model validation, “what-if” analysis, and trade studies at the systems engineering level. At the product design level, Intercax has worked with customers on aerospace, land, marine and IT applications. Here, a federation of models across engineering domains supports multiple use cases, including evaluation of product variants, integration of networked components, and reverse engineering and documentation of legacy systems. Syndeia, the Model-Based Engineering platform from Intercax, provides an unprecedented level of traceability across domains while helping restrict some parts of system information on “need to know”. Syndeia, a platform for MBE/MBSE, provides capabilities to: (1) connect to enterprise PLM (Windchill, Teamcenter), ALM (GitHub, JIRA), databases (MySQL), requirements management (DOORS-NG), and other version-managed systems; (2) query and search models, such as bill-of-materials, requirement structures, CAD (NX, Creo), database tables and records; (3) generate, connect, compare, and sync models, such as system architecture (SysML) to/from PLM bill-of-materials, Simulink, Database/Excel; and (4) visualize all model-based connections using interactive charts. SysML parametrics can be used to setup analysis models integrated with the system architecture for computing key measures-of-effectiveness (MoEs) of defense systems, such as performance, cost, and availability. Our SysML Parametric Solvers (ParaMagic, Melody, Solvea, ParaSolver) provide advanced capabilities that abstract the system of equations and execute them using commercial/open-source math solvers and simulation engines such as Mathematica, OpenModelica, and MATLAB. Rapid system modification in the face of changing battlefield requirements has become a critical priority for defense organizations. One difficulty in addressing this need is the effort in composing viable hardware/software configurations drawing on system information distributed across multiple data repositories. Intercax has developed a Model-Based Engineering platform Syndeia to address this. 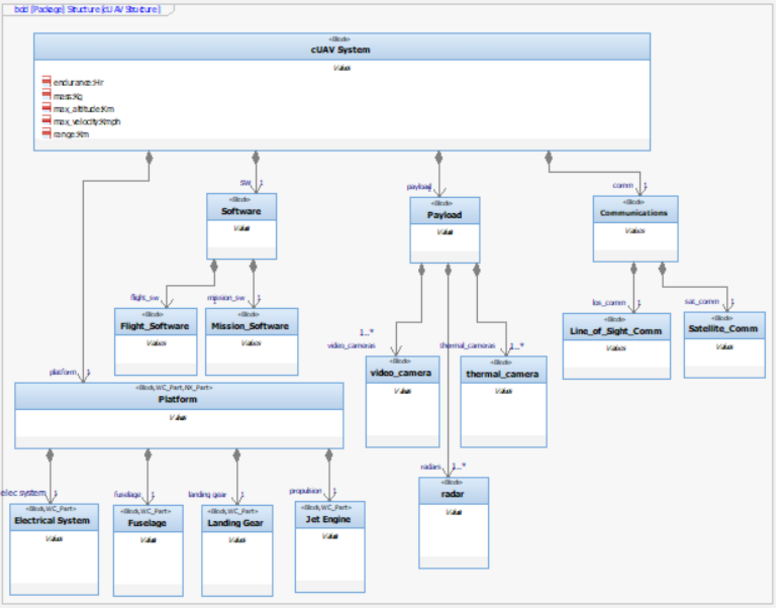 A high-level architectural model for a configurable UAV is created in SysML (IBM Rational Rhapsody in this example), as shown in the first figure above. The individual elements are linked to subsystem models in PLM, CAD, ALM and simulation tools and further connected to requirements and project management information. 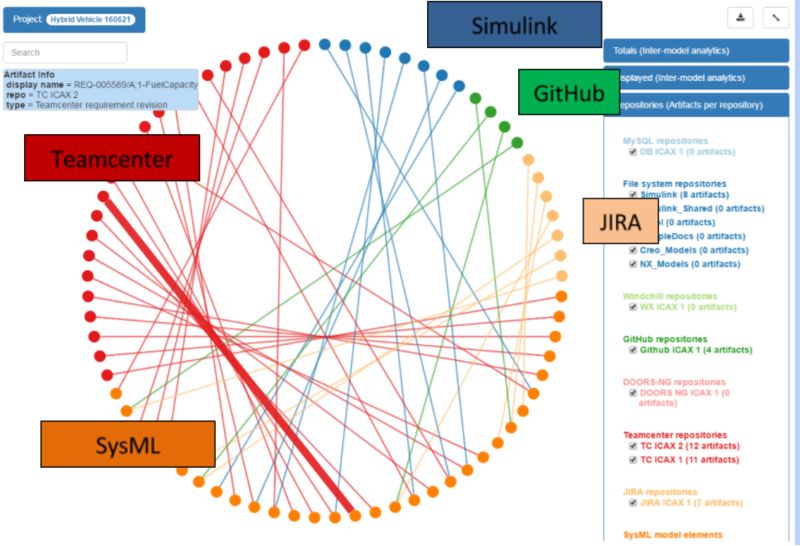 The second figure is a visualization of the connection database for a specific UAV configuration, linking the SysML model elements to corresponding model elements in Teamcenter (PLM), GitHub (ALM), Simulink (simulation) and JIRA (project management). These connections allow on-going information comparison and transfer between tools to create a Total System Model that can be evaluated and ultimately assembled and tested in a shorter time. Properly-managed connections can not only share information; they can restrict what parts of the models are shared to protect confidential or proprietary data. Advanced MBSE techniques are equally applicable to trade studies on defense system variants. 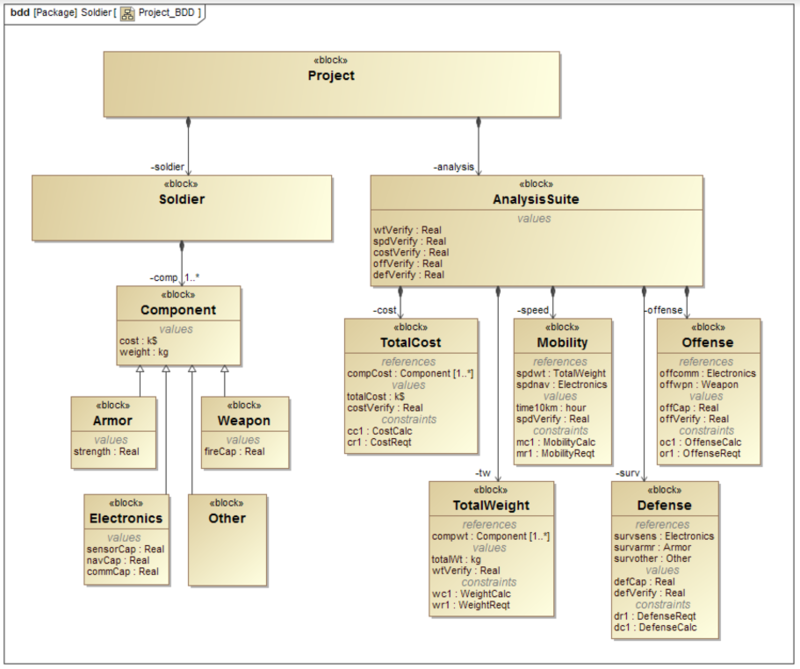 In this study, alternate equipment packages for an infantry soldier, and the analysis models for cost mobility and other metrics were incorporated in a single SysML model, shown in the MagicDraw block definition diagram in the first figure below. The analysis models were realized in SysML parametrics and evaluated using ParaMagic (Intercax) for a series of alternate body armor configurations realized as instances of the model. As defense architecture standards have moved from purely graphical templates like DODAF/MODAF to model-based standards such as UPDM and UAF, opportunities arise to build in analytics that integrate modeling with simulation. 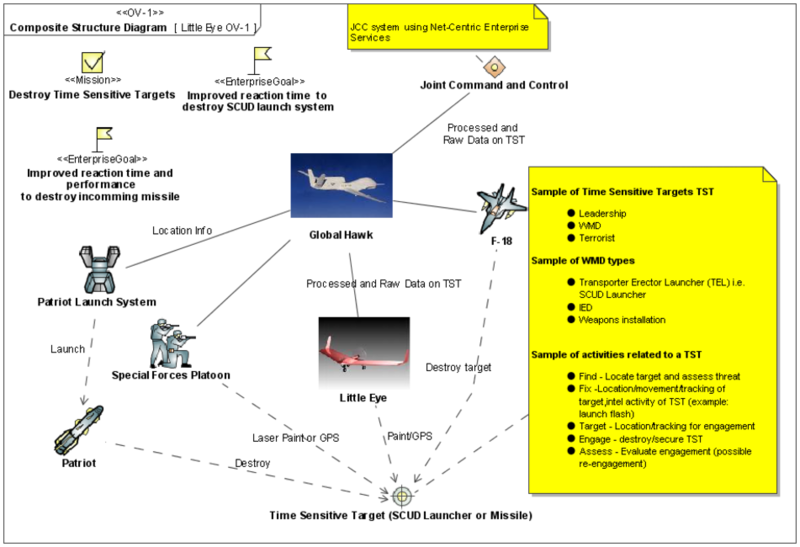 The OV-1 diagram above describes a complex response scenario to the detection and neutralization of time-sensitive targets like mobile missile launchers. Simulation using Monte Carlo techniques explicitly includes the uncertainty in such scenarios in terms of the timing and location of the target. Even simple models captured in SysML parametrics provide valuable feedback on assessing system feasibility early in the development cycle when major design decisions must be made. Monte Carlo results generated by ParaMagic (Intercax) for the total defense response time are shown in the table above.